Flatiron Cambodia Meridian is a freehold grade A office combine with apartment hotel nestled in the heart of Phnom Penh city centre. 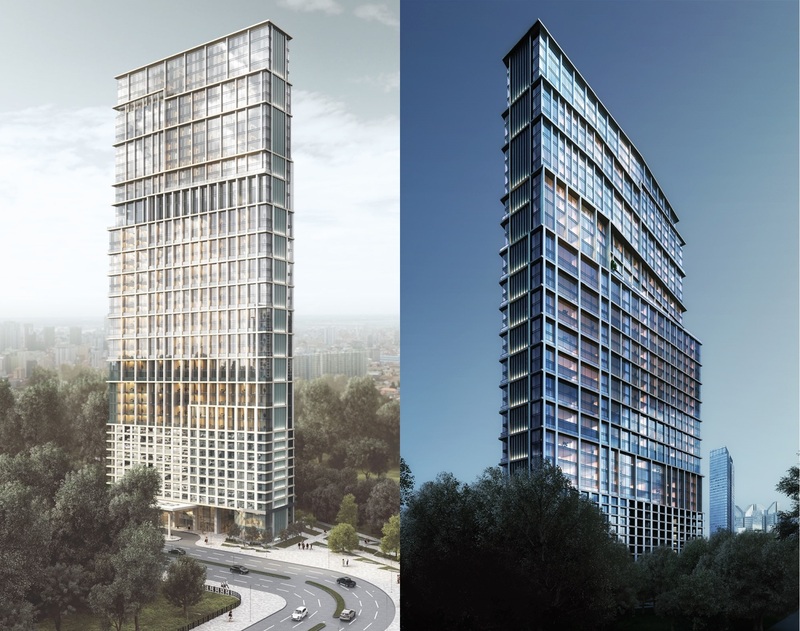 Inspired by New York’s greatest architecture, Flatiron, Meridian International Holding delivers the same quality building in the capital of Cambodia. 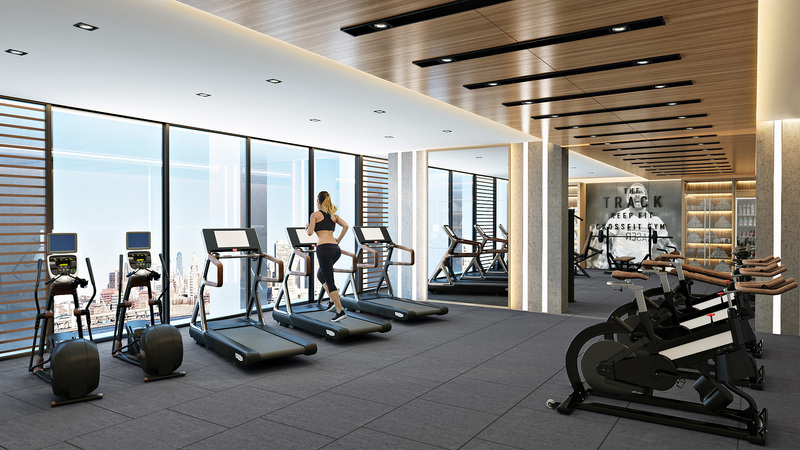 Flatiron Cambodia Meridian showcases the creativity of the new generation yet retaining the essence of Flatiron in New York city and modernizing with massive contemporary glass structure and state of art interior facilities. Flatiron is 41 storey building inclusive of Apartment Hotel and office space with total gross floor area of about 84,000 sqm featuring a circular drop off area at the entrance of the building, gracious pedestrian space and beautiful landscaping. 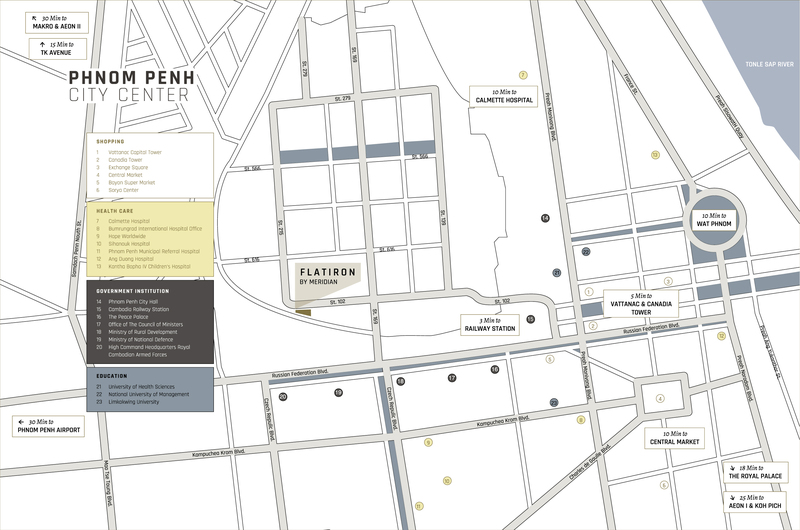 Flatiron Meridian is located in the prestigious spot of Phnom Penh City Centre. 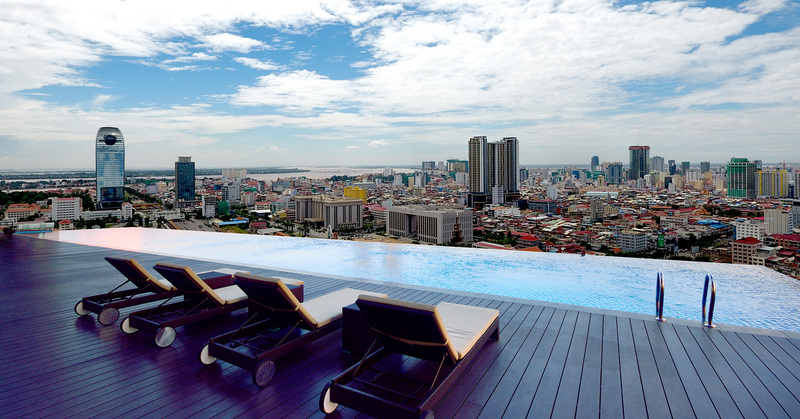 It is truly at the heart of the vibrant city of Phnom Penh where international talents meet with local expert. Flatiron Cambodia Meridian facilities is located in level 28 for the Apartment Hotel include lounge, infinity pool, gym, sun deck yoga, and social kitchen. Total rental guarantee for Grade A Office is 95% over 10 years, Apartment Hotel is 85% over 10 years and after 10 years, investor has option to sell back the unit to developer. For investors who would like to invest overseas property usually stumble upon the issue on managing the property after completion. But all these issues do not exist for Flatiron by Meridian. 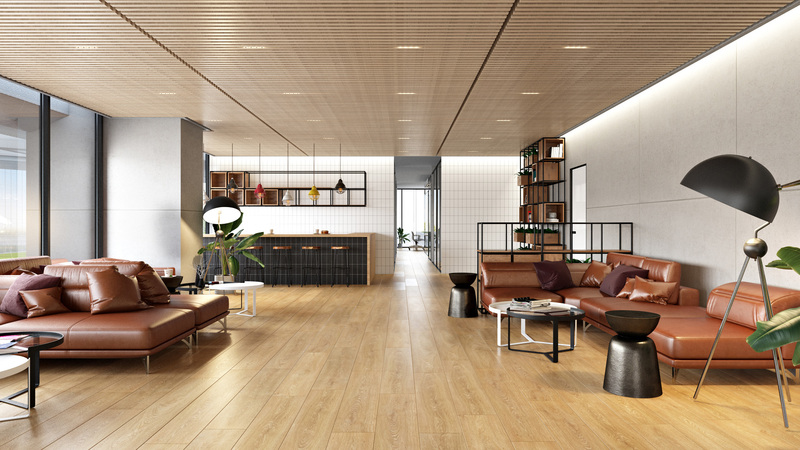 The general property management of Flatiron by Meridian will be managed by Ascott Group under Citadines Brand. It is an assurance to a buyer who invest Flatiron by Meridian with its good ‘after-sales’ services. 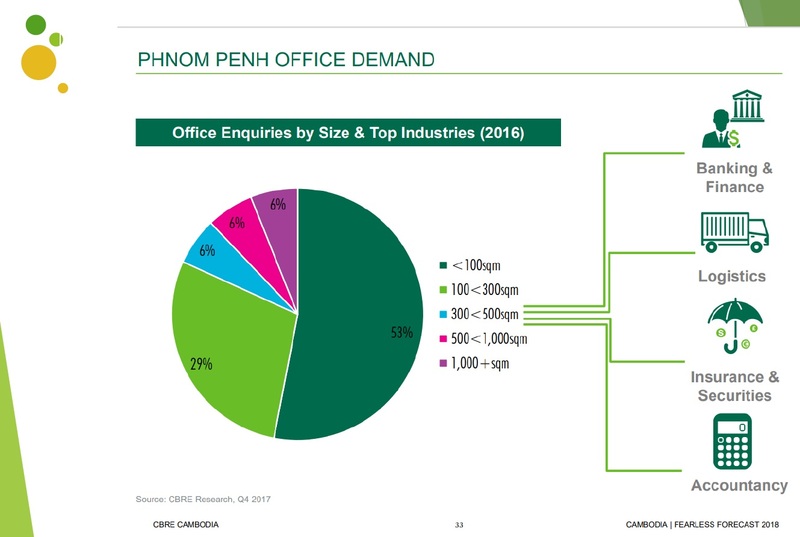 Many investors, local or abroad, want to invest in the real estate in Phnom Penh but are lacking in leasing experience. Flatiron by Meridian provides a total solution via the services by Ascott. Meridian International Holding is a multinational group of companies with a strong base in the textiles & garment business and property investment is no stranger to Cambodia. 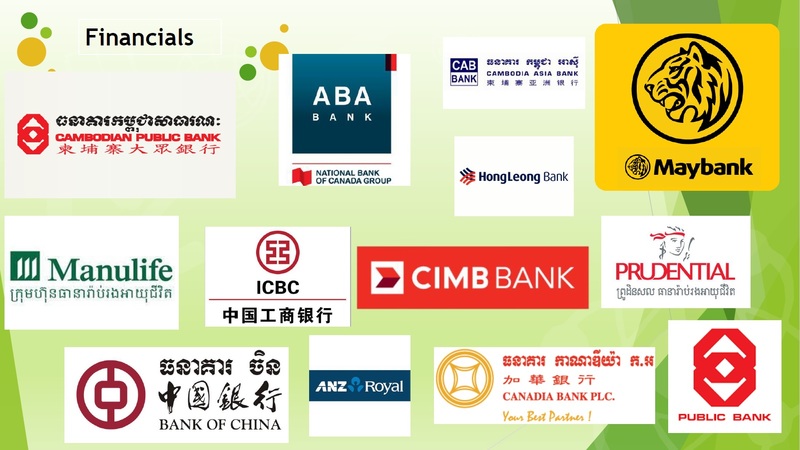 With over 70 years combined experience in manufacturing and marketing operations in Hong Kong, China, Europe, Singapore, Japan and Cambodia, the group has been investing and conducting business in Cambodia for many years. It has invested over $100 million, providing jobs for more than 1,000 people across its business units and is continuing to fund and grow the group's contributions in Cambodia. Meridian International Holding’s impressive credentials originate from its unwavering attitude towards providing quality product through innovative thinking supported by keen attention to detail coupled with service excellence propelled by its vision to materialise a strong Meridian brand that is here to stay. Meridian International Holding’s founder and CEO, Mr. Ko Sek Yan is a strong believer in values and has been instrumental in building the group since the 1980s. "We strive to develop products with good value, delivering quality properties with sophisticated designs at prime locations", he said. Meridian International Holding’s co-founder, Mr. Salomon Wolf, who hails from Germany, revealed that the group has been investing in Cambodia’s real estate market since the beginning of 2010. Wolf, who is very much involved in the group's business in Cambodia, is a very successful entrepreneur with a strong acumen for business development. Flatiron By Meridian Apartment Hotel component will be fully managed by Ascott Limited Group under the Citadines Brand. Who is Ascott Limited Group? The Ascott Limited is a member of CapitaLand Singapore. It is an international serviced residence owner-operator with more than 73,000 units in over 500 properties, spanning over 130 cities across 30 countries like the Americas, Asia Pacific, Europe, the Middle East and Africa. Its portfolio of brands includes Ascott The Residence, Citadines Apart’hotel, Somerset Serviced Residence, Quest Apartment Hotels, The Crest Collection and lyf. 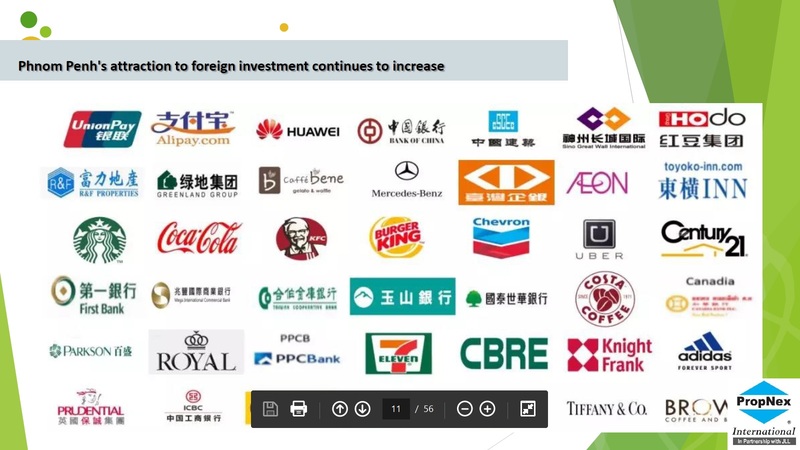 The asset size of Ascott Reit has grown to S$5.2 billion, four times the amount since it was listed on the Singapore Excahange Securities Trading Limited (SGX – ST) in March 2006. Ascott Reit clinched the “Best REIT (Asia)” award by World Finance magazine at its Real Estate Awards in 2015. With international renowned service residence operator such as Ascott group on board to manage your unit, rest assured that your investment will be hassle free and high in return. 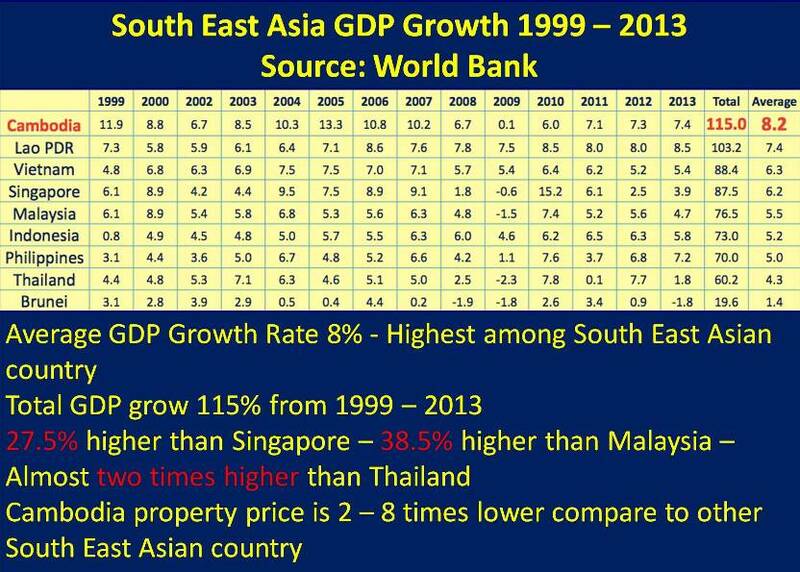 On average, Cambodia economic growth is growing at 7% per annum and it is projected to keep this high rate of growth for the next couple of years. 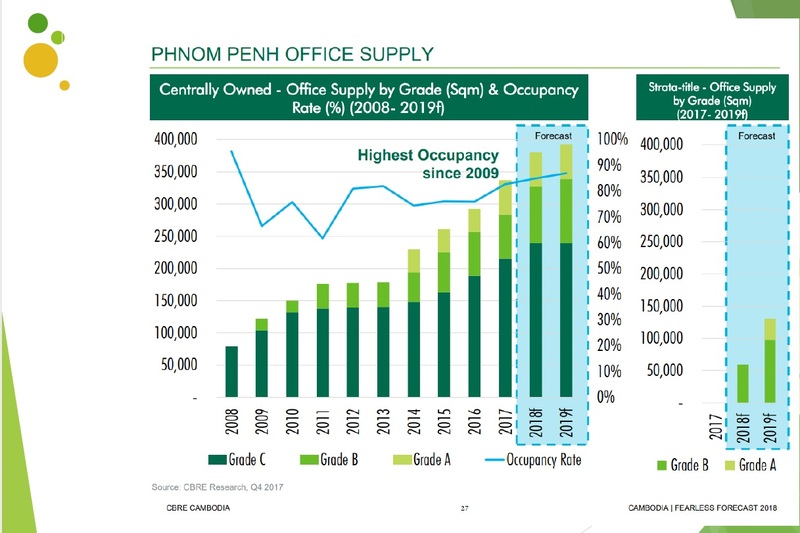 About 70% of Cambodia population is below 30 years (productive age), this will continue to drive economy activity and demand for properties especially office spaces will rise as more jobs will be created. Posted in Cambodia, Phnom Penh and tagged cambodia office, cambodia property, flatiron, flatiron cambodia, flatiron meridian, flatiron phnom penh, phnom penh office, prhnom penh property, rental guarantee.